Interviews with locals of Canterbury affected by the 2011 earthquake. Buffalo Milk revisited Canterbury in January of this year, almost three years after the 2011 Christchurch earthquake. Having taken 185 lives and 70 percent of the city’s infrastructure it’s a wonder how Christchurch is not a ghost town. 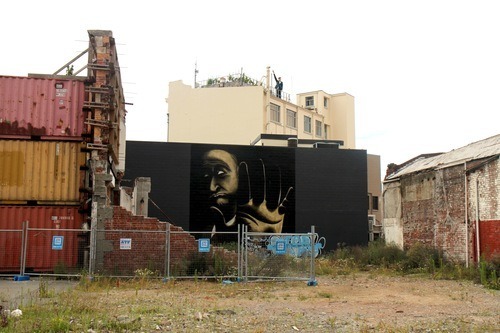 Instead what we discovered was a re-emerging nightlife, a thriving art scene, a strong sense of pride and community from locals and hope for the future of what used to be New Zealand’s second largest city. Their CBD boasts an innovative container mall, street art, pop up café’s, markets, whiskey bars and galleries, and most of these initiatives have been sought by young entrepreneurs – seeing opportunity despite devastation. ‘Home’ for most, is not just the four walls around you, it is your city/ community too. We wanted to talk to locals of Canterbury about what it was like to lose their city and ask them if and how their concept of home had changed since February 22, 2011. Edward a business owner living in Sumner at the time of the earthquake described the turmoil as a “war zone”, stating that “survival and the day to day necessities of life – food and water, shelter and warmth, toilets and washing facilities were all that were important in the immediate weeks that followed”. Having lost his home of twenty years and family business, the impact was desolating. Joanna a Clinical Psychology student at Canterbury University was in a café on Poplar Lane at the time of the earthquake, Joanna survived, Poplar Lane did not. Joanna now places less emphasis on the physical and believes home is what you make it. “It’s quite sobering when you realize that your house might just fall down if there was another quake. I crave a ‘home’ and need a secure and calm place to be, however, I’m aware that the items I collect for my home may be transitory and have to be things I can let go of and do without. I use plants, flowers, old glass bottles, candles or things I have made to create the feeling of ‘home’ – all of which can be replaced easily. I guess when looking at what Christchurch has lost during the earthquakes a ‘home’ now has to mean ‘where you are’. It does not necessarily mean the house or structure anymore. It has to be a space you can create and recreate anywhere. My family and friends are my real home and they are still here”. Jane an Interior Designer from Governors Bay, recalls the events of the earthquake and was surprised by her personal and practical strength at the time of chaos. She’s a loyal Cantabrian stating, “we’re in this together”, having remained in the area working in the building industry, Jane is all too familiar with the hassles of damage and repair. Her losses however were much greater than a home or business “the greatest sadness for me was the loss of my darling mother two weeks after the quakes. She was in a rest home beside a very tall cliff which collapsed. The owner was killed and the residents were evacuated after two days, many to rest homes in other cities. My mother had Alzheimer’s and there was only one bed left in Christchurch in a high security dementia unit. We had no choice but to agree to put her there. To leave her rest home family and go into a cell like room with bars on the windows with unfamiliar caregivers completely threw her and we made a mercy dash through army tanks and guards to get her out. I flew with her to the bottom of the south island to a catholic hospital who agreed to take her under duress. She was uncharacteristically agitated and stopped eating. She died within two weeks, of pneumonia, the last thing I said to her was “I love you”, her death was premature, as were the deaths of many people”. A powerful message for everyone, not just those struck by natural disaster. The future is bright for Canterbury and Christchurch city; the earthquake was a reminder that people really do make a place. Some people will never experience great loss, but those who do and still have the strength to pick up the pieces and look to the future are more than their four walls.